10:05 "I have three squads in 75Z5" This is overstacked in a dense-jungle hex (G2.2) and is illegal during initial setup (A5.1). Eric T: Responding to your three rules observations. I believe you are correct on all three. 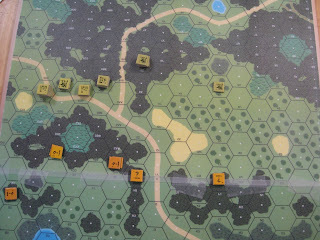 1) A dense jungle has stacking limit of 2 FS, not 3, so Mike may have not been able to move that many units into the Location to rally, but i didn't think of it at the time. 2) I suppose that you are right on that one too. If you defensive fire at the DC placer as he expends MFs in the act of DC placement, then he'd be placing the DC on an unconcealed defending unit at that point. I suppose if I had held fire until such time as he expended additional MFs after the DC placement, then I would receive the benefit of concealment on the DC placement on me, but that is not what happened. 3)i wasn't sure about that one and just "went with it" as it was a point in the game when it wasn't vital to the outcome. thanks for checking the details!